It's interesting that you posted this today because my b'day is in exactly one month and I found the cake I want! Oh my, this sounds absolutely amazing. Raspberry and almond is one my favorite flavor combinations. The frangiapane sounds dreamy. I even love your buttermilk yellow cake. 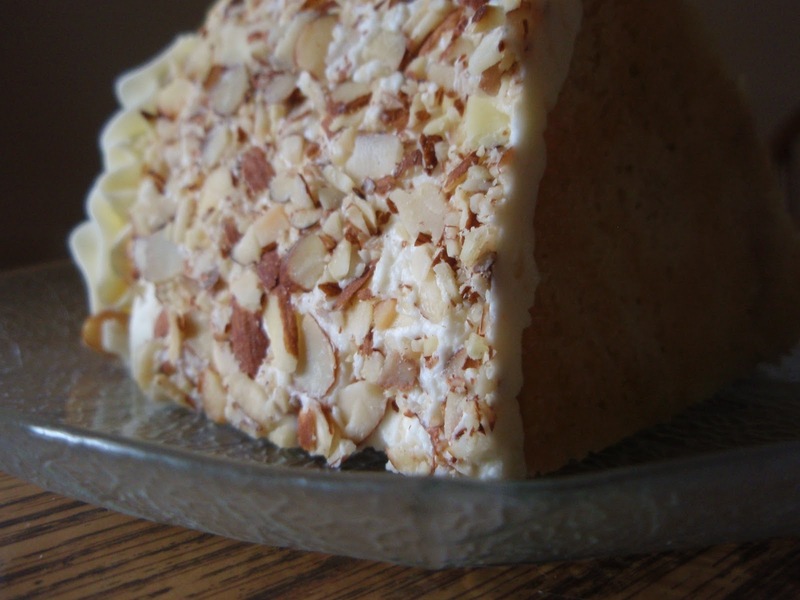 It even looks pretty with the sliced almonds on the outside...and incredibly moist. This is what easter is going to look like on my dessert table! It is breakfast time here...I don't thing the cake cares...I would have a large piece if I could. This looks amazing! beautiful cake! i can't wait to meet Fran, i could use a new tasty friend! ;-) bravo! I'm nuts about frangipane, no pun intended ;) and your cake looks spectacular, I love how you can see the moist gooey jam sinking into the cake layer. What a beautiful cake! I love raspberry and almond together! Frangipane is one of my favorite things; I can't wait to try this! Looks so darn good! Also that's a great ides of putting simple syrup in a spray bottle, I think I just might do that! Should I keep that refrigerated? I love the almonds on the side! I adore almonds and almond extract. I can drive everyone else nuts with it sometimes. This is one beautiful cake; I'm glad Fran made your acquaintance. Beautiful cake! Glad you met Fran. Now that you know her you will have a hard time getting rid of her, she'll stick to you like glue when your at the gym! 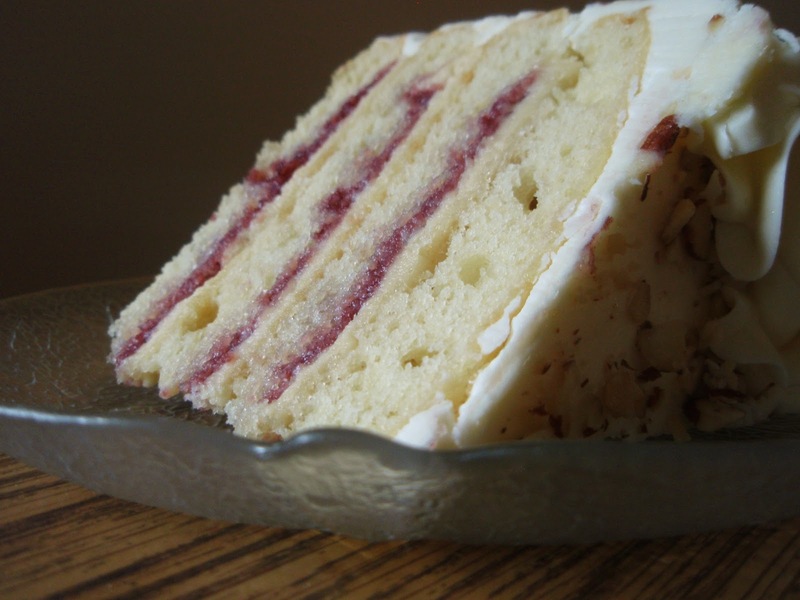 Really lovely cake--I've always liked nuts on the outside and lots of layers! This looks delicious I love the flavour of almond, though it took me a few years. This is not what I know as frangipane. I know it as a mix of almost equal parts butter sugar eggs and almond meal that is cooked in a tart shell....... you learn something new every day.! Now that sounds like a good cake! o yes..I adore frangipane.....this 4-layered cake looks divine! Oh dear...I really need to make acquaintance with frangipane too! It sounds gorgeous! Un pastel hermoso lleno de sabores toda una delicia,abrazos hugs,hugs. Mmm! 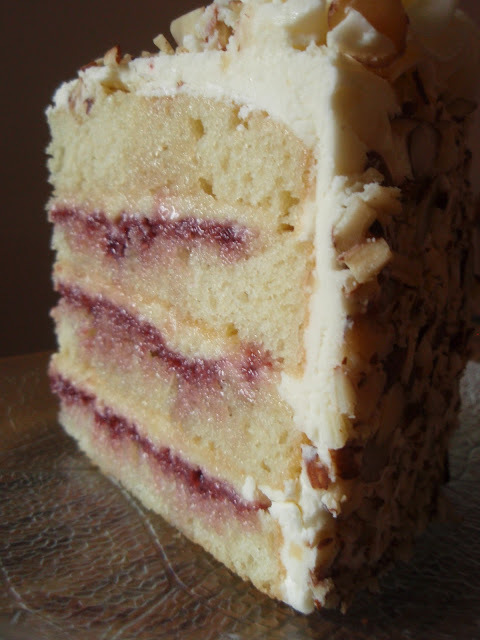 Raspberry with almond is simply irresistible! I do love almond flavoring, and frangipane is wonderful. I know I'd love that cake! I was smitten when you said "almond buttercream". I love your cake creations Grace, and I have noticed that you always split the layers in half. I'll come to your house for cake anytime as they always look so moist and decadent, just as a good cake should! I love the adding of a syrup and the spray bottle is a great idea (I've done it using a pastry brush but that drags crumbs). Wow! That cake looks so moist and delicious! Happy Easter! I wish I could have a bite right now with each and every component. The raspberry preserves between layers looks lovely! Beautiful and delicious! I ALWAYS leave your site drooling. Seriously. Frangipane is my actual favourite. I like anythign with almonds, but it's texture is so lovely! This cake is ACE Grace. All kinds of ace. This might be your best creation yet! A dream is right, this is gorgeous. Dear Grace, Thank you for your visit. I am following your blog now. It is a beautiful blog full of delicious and tempting recipes. I hope that we will be blogging friends. I made this cake tonight and the cake itself turned out beautifully, but the Frangipane on the other hand was a disaster!!! I followed the recipe to a T and it was so runny and watery. I did a search later for recipes just for almond Frangipane and non of them call for milk and all that heating nonsense. If I had skipped that, then yes I think it would have been better. Can't wait to frost the cake in the morning and serve at Easter. I love frangine and this look amazing!!!!! Oh my, this cake looks incredible! Going to pin now so I don't forget about it!!! what a stunnning cake, layer upon layer of flavor. thanks for the tip, will use it next time! I love this cake - it sounds and looks so good! This raspberry almond cake looks gorgeous. I bet its very delicious. Ok, I've never had frangipane before, but this cake is seriously calling my name! I found this cake/ recipe/ blog site by searching through Google (thank you Google!). Last March (March 2016) a co worker asked if I would make her a cake, something with raspberries so I looked to Google for a recipe- and found this one. WHAT.A.SUCCESS. I brought the cake to work and shared my co worker's birthday with the rest of my department. By chance one of our VPs was walking by and we invited him for a piece of this decadence. This VP is a good old Southern boy from Louisiana. After his first bite, he went in to a trance of sorts and began telling the story of when he and his wife of 20+ years were married. He explained that they had an elderly/ retired woman make their wedding cake. This cake was talked about for months after his wedding, it was THAT good. He has never had a cake to match it since, and often whished that he could have just one more piece of his wedding cake- until now. He was thrilled to have found THE cake. So thrilled that he asked if I would make this cake for his son's graduation party- he paid me! Since then, this cake has been on everyone's request. I made it again for our Christmas pot luck lunch. Another VP hip checked and moved people out of the way to get the last piece. Thank you so much for sharing this magnificent recipe. Does the frangipane get cooked? I didn't see anything about cooking it in the recipe but the ingredients list a full egg so I wanted to confirm. Thanks. @Anonymous: The frangipane is not cooked in this application, and I definitely should add a warning about that! Thanks for pointing that out! Hi, this cake looks divine! It has everything I love...almonds and raspberry! However, are you able to suggest a substitute for the egg in the Frangipane? Thank you! @Anonymous: I'm afraid I don't have much experience with egg replacements. I did google egg-free frangipane and found some recipes, so following one of those instead might be your best bet!